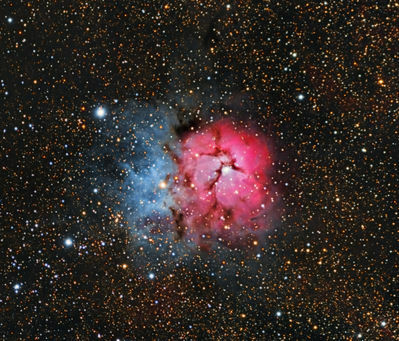 Messier 20, aka the Trifid Nebula, is both an emission nebula (H-II region imaged in red) and reflection nebula (blue coloration), which is found in the constellation Sagittarius. M 20 is a young star forming region. Image was taken with a TeleVue 140 f/5 refractor and a SBIG ST2000xcm camera (@ -15 degrees) on an Astro-Physics 1200 mount. Image is a total of 4 hr 20 min exposure (26 x 10 min lights, 64 flats, 64 bias, 15 darks) that was calibrated, aligned, integrated (PixInsight nomenclature for combined), and processed in PixInsight 1.8 with final levels/curves in Photoshop CS6. Optec Alnitak panel used for flats.